Why is important. It is in fact the starting point. Without it, our business, is just another commodity. Plenty of companies do what we do. Some do it how we do it. It will be rare that any can beat us at the why. How do you explain when things don’t go as we assume? Or better, how do you explain when others are able to achieve things that seem to defy all of the assumptions? For example: Why is Apple so innovative? Year after year, after year, after year, they’re more innovative than all their competition. And yet, they’re just a computer company. They’re just like everyone else. They have the same access to the same talent, the same agencies, the same consultants, the same media. Then why is it that they seem to have something different? Why is it that Martin Luther King led the Civil Rights Movement? He wasn’t the only man who suffered in a pre-civil rights America, and he certainly wasn’t the only great orator of the day. Why him? And why is it that the Wright brothers were able to figure out controlled, powered man flight when there were certainly other teams who were better qualified, better funded … and they didn’t achieve powered man flight, and the Wright brothers beat them to it. There’s something else at play here. About three and a half years ago I made a discovery. And this discovery profoundly changed my view on how I thought the world worked, and it even profoundly changed the way in which I operate in it. As it turns out, there’s a pattern. As it turns out, all the great and inspiring leaders and organizations in the world — whether it’s Apple or Martin Luther King or the Wright brothers — they all think, act and communicate the exact same way. And it’s the complete opposite to everyone else. All I did was codify it, and it’s probably the world’s simplest idea. I call it the golden circle. Why? How? What? This little idea explains why some organizations and some leaders are able to inspire where others aren’t. Let me define the terms really quickly. Every single person, every single organization on the planet knows what they do, 100 percent. Some know how they do it, whether you call it your differentiated value proposition or your proprietary process or your USP. 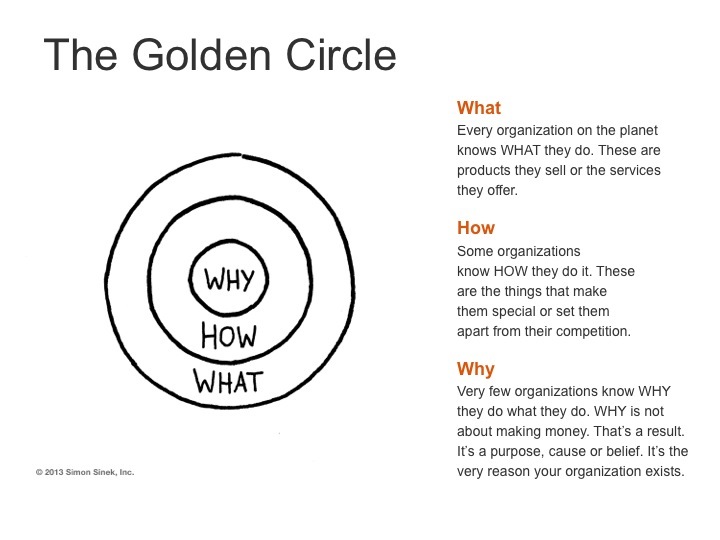 But very, very few people or organizations know why they do what they do. And by “why” I don’t mean “to make a profit.” That’s a result. It’s always a result. By “why,” I mean: What’s your purpose? What’s your cause? What’s your belief? Why does your organization exist? Why do you get out of bed in the morning? And why should anyone care? Well, as a result, the way we think, the way we act, the way we communicate is from the outside in. It’s obvious. We go from the clearest thing to the fuzziest thing. But the inspired leaders and the inspired organizations — regardless of their size, regardless of their industry — all think, act and communicate from the inside out. Reblogged this on Jane Eldridge.